1. Break eggs in a large bowl. Draw the letter Z on the bottom with the tip of the chopsticks, do not foam. 2. Little by little, add cooled dashi and then salt, soy sauce. 3. To improve texture, strain egg through a net. 1. Remove white sinewy tissue from sasami chicken meat. Cut into bite size pieces. Sprinkle with soy sauce. 2. Remove black vein from shrimps. Devine except for tail. 3. Remove roots of shimeji mushrooms, tear into easy to eat pieces. 4. Cut mitsuba (trefoil) into 3cm pieces. 5. Thinly slice peel of yuzu. 1. Prepare 4 Chawan mushi serving cups. If serving cups with lids are not available, use tea cup covered with aluminum foil. 2. Divide fillings into 4 except for mitsuba and yuzu strips, neatly place filling and kamaboko slices in individual cups. 3. Pour in egg mixture. 4. Fill a double-boiler pan (mushiki) half full with water. 5. When water comes to a boil, place cups in to steam. 6. Cover with cheesecloth, place lid slightly off so that steam can escape. 7. Heat 1-2 minutes on a strong fire, reduce heat and cook for an additional 12-15 minutes. If the fire is too strong or if steamed too long, Chawan mushi becomes spongy, loses flavor and attractiveness. 8. Insert bamboo stick to check readiness. If clear liquid rises Chawan mushi is ready. 9. Take cups out of steamer. Top with mitsuba and yuzu, re-cover. 10. Chawan mushi is served chilled in summer, hot in winter. note: When double boiler is unavailable, place net on bottom of pot. 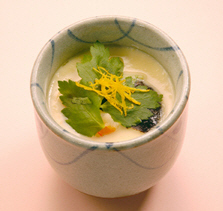 Chawan mushi can also be prepared in the oven . Place cups in large pan 70% filled with water. Bake at170 c for 20 minutes. To prevent the surface from burning, double cover ( under lids) with aluminum foil. Beruang paling malas di dunia..